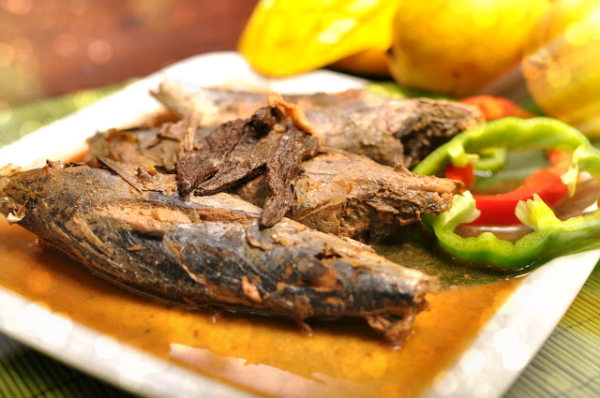 Among the popular fish delicacies that Batangueños like to cook is the tulingan or the mackerel, usually cooked ‘sinaing’ or boiled style like that of rice. Sinaing na tulingan is preferred to be cooked in a clay pot with the mackerel sometimes wrapped with banana leaves to enhance its flavor. Sinaing na tulingan became a staple dish in the province and had been listed to its most popular dishes. As a main dish, sinaing na tulingan is delicious when served with slices of ripe tomatoes, onion, and green mangoes. with Tequila Mango Sauce and Toyomansi Caviar is a delicious proof that, indeed, Filipino Chefs are world-class and Filipino cuisines is at par with the worlds best. 1. Remove gills and all internal organs of the fish then chop off tail. 2. Slit both sides of the fish and press against the sides with palms of the hands to flatten the fish and soften its flesh. 3. Wash thoroughly under running water, till water runs clear. Rub fish with salt in and out. 4. In a saucepan, arrange the pork fat at the bottom then some of the dried kamias. 5. Put the fish on top side by side. Add the rest of the ingredients. 6. Cook slowly on very low heat and simmer for about 2-3 hours till fish is done.